Refreshing Tastes of Summertime: Tomatoes and Watermelon are filled with flavor and benefits! It is summer, and we are surrounded be the refreshing flavors of foods such as tomatoes and watermelon. These foods not only taste great but have a barrage of health benefits as well! Did you know for example that a two cup serving of diced watermelon has only 80 calories and contains vitamin C to help boost immunity and vitamin A for healthy skin and eyes? Tomatoes and watermelon both contain the antioxidant lycopene. Evidence has found that eating foods with lycopene may aid in sun protection so eat some before you spend time outside to get help from an internal sunscreen! Tomatoes are also packed with vitamins and are high in vitamin C and satisfy 10 percent of your daily potassium needs. 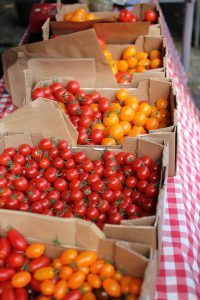 According to the Florida Tomato Committee, the most important thing to remember is to never refrigerate tomatoes, as a chilled tomato will not finish ripening, and it kills the flavor. Should you store a tomato with the stem up or down? Stem end up! Storing tomatoes upside down can bruise them. Here is a light and refreshing salad that uses tomatoes and watermelon and is bursting with the delicious flavors of summer! Ripe tomatoes and crisp cucumbers are brightened with basil and red onion and tossed with juicy watermelon for a refreshing treat. 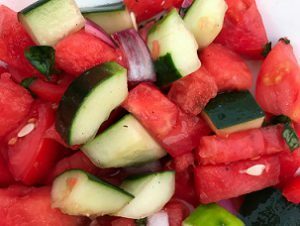 Toss the tomatoes, watermelon, cucumber, and onion together in a large bowl and set aside. Dressing: Combine vinegar, olive oil, salt, and pepper in a small bowl. Pour vinaigrette over the watermelon mixture and toss to combine. Cover and refrigerate for up to 2 hours. Sprinkle with basil (and feta or goat cheese if desired) and serve. Recipe adapted from Country Living Magazine (http://www.countryliving.com/food-drinks/recipes/a1156/tomato-watermelon-cucumber-salad-3263/). Andrea Nikolai has a Masters in Public Health Nutrition, is a registered dietitian nutritionist, and works with UF in Polk County as the Family and Consumer Science Agent. Her goals are to help improve the lives of others, help make the healthy choice the easy choice, and show others how eating healthy can be delicious and fun.